Here's a gourd that cooks up true to its name. 1 Preheat oven to 320° F.
3 Place whole squash on a baking sheet. 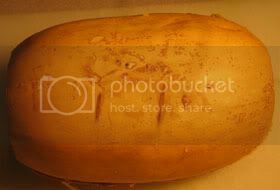 (You may also place this squash directly on an oven rack, but be sure to line the lower rack with aluminum foil to collect any drippings.) Cook for approximately 1 to 2 hours, turning every 20 minutes to ensure even heat distribution. Cool whole at room temperature for about an hour. Note: The total cooking time will depend on the size and quality of your squash. Remove from the oven when it softens and gives easily when pressed. The squash shown cooked for 1.5 hours. 4 Slice off the top and bottom in cuts perpendicular to the squash. Make a cut down the length of the squash. Carefully scrape out seeds and discard. 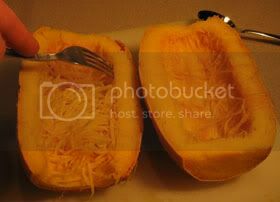 Use a fork to fluff out the squash fibers, first perpendicular (along with the grain) and then lengthwise (opposite to the grain) onto a serving plate. 5 Serve with traditional pasta sauce or by itself with salt, pepper, and a grating of good parmesan cheese. 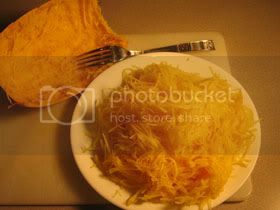 I love spaghetti squash! I've never tried baking while it was still whole, though. I usually cut it in half and bake for 45 mins to an hour. And yes, it's delicious with almost any sauce. YUM!